The Royal Australian Navy (RAN) has commissioned a bereavement pin to recognise the valued contribution of all Navy personnel who lost their lives while in the service of the RAN, and the nation. 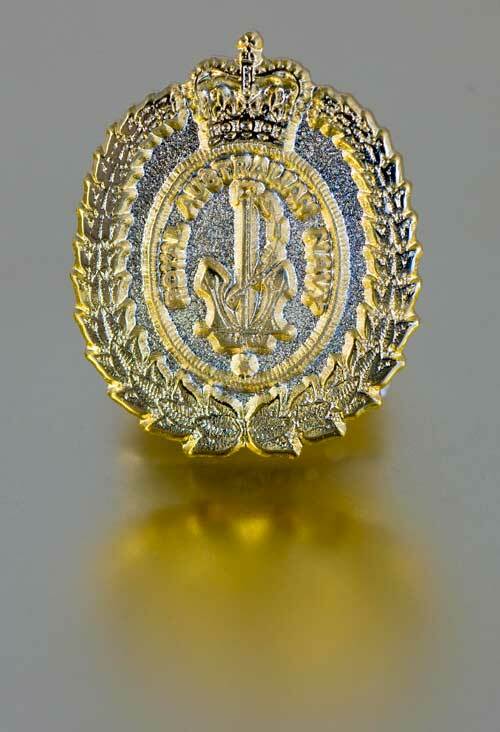 The Navy Bereavement Pin is a distinctive 20mm gold lapel pin which has the crest of the Royal Australian Navy encompassed by wreath 'supporters'. The Navy Bereavement Pin has been developed to meet an expressed wish by many families, who have lost a close family member while they served in the Navy, to have a tangible yet discrete memento of the service of their loved one. The Navy Bereavement Pin is a symbol that can assist family members to commemorate the life and service of a relative who was lost while serving in the Navy. 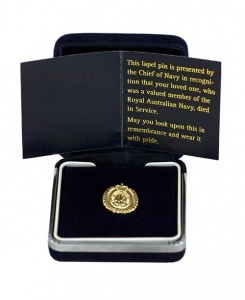 It is the Chief of Navy's wish that by prominently wearing it or having it as a special keepsake, the Navy Bereavement Pin helps you to remember proudly the family member you have lost and reminds you that you are very much considered a part of the broader Navy family. As a family member, may you look upon the Navy Bereavement Pin in remembrance and wear it with pride. To assist with a successful nomination for a Navy Bereavement Pin, your relative must have died whilst still serving in the Navy. To be considered a relative, your family connection can be through direct relationship by birth or relationship by marriage. 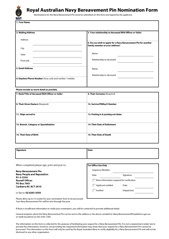 Navy Bereavement Pin application form. Please allow up to 5-6 weeks for your nomination form to be processed. Your Navy Bereavement Pin will be sent through the post. If there is insufficient information to verify your nomination, you will be contacted to provide additional detail. Unfortunately, responsibility cannot be accepted for misdirected applications or lost/misdirected mail. General enquiries can be submitted via email using the form below or you can call (02) 6265 3383. As the e-mail address and phone are monitored on a part time basis, Navy will endeavour to attend to your enquiry within ten working days. When using the form below, remember to check that your email address is correct before clicking on the "Send" button, so that we are able to contact you if necessary.